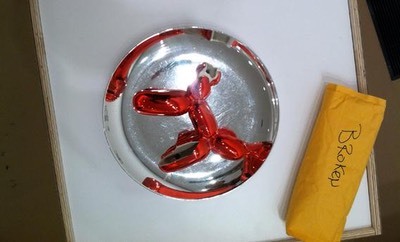 Jeff Koons Balloon Dog, broken. Wrote up the curatorial effort of Elka Krajewska and Mark Wasiuta. Work that has been declared no longer art (by art insurancers): on display at a gallery. To give a brief explanation of art that is no longer art: Sometimes the cost of restoring a work of art exceeds the value of the work, in which case the insurer declares a total loss, and the work is declared no longer art—that is, of no market value. The damage can range from obvious to subtle—from a ripped painting or shattered sculpture to a wrinkle in a photographic print, or mold damage which can’t be seen at all. As it wouldn't do to send the not-artwork to the crematorium—the work might be of scholarly value, or might one day be worth repairing, or might one day be more easily repaired—the work is stored, not dead, but in a state of indefinite coma. The Salvage Art Institute, Elka's curatorial brainchild, collects and exhibits not-art.